Something a little different by way of an experiment – mono and stereo go head to head in the classic “Which is best, chocolate or vanilla?” contest. 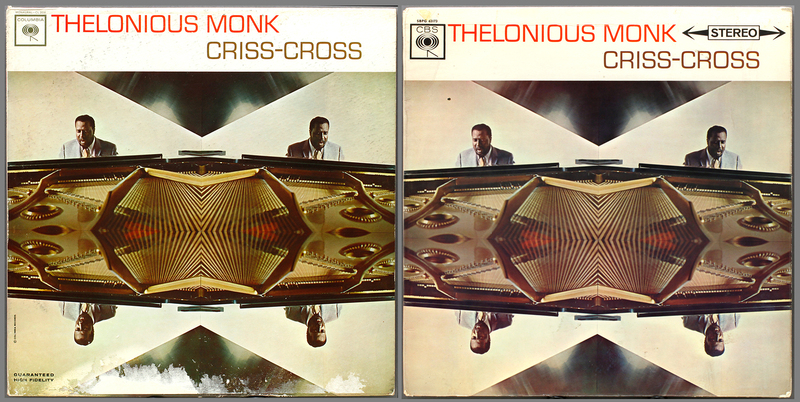 The brilliant Monk record Criss Cross, considered by some his best work in a studio environment, certainly by me. All Music Review by Lindsay Planer: “Hackensack” — a frenetic original composition — opens the disc by demonstrating the bandleader’s strength in a quartet environment. The solid rhythmic support of the trio unfetters Monk into unleashing endless cascades of percussive inflections and intoxicating chord progressions. 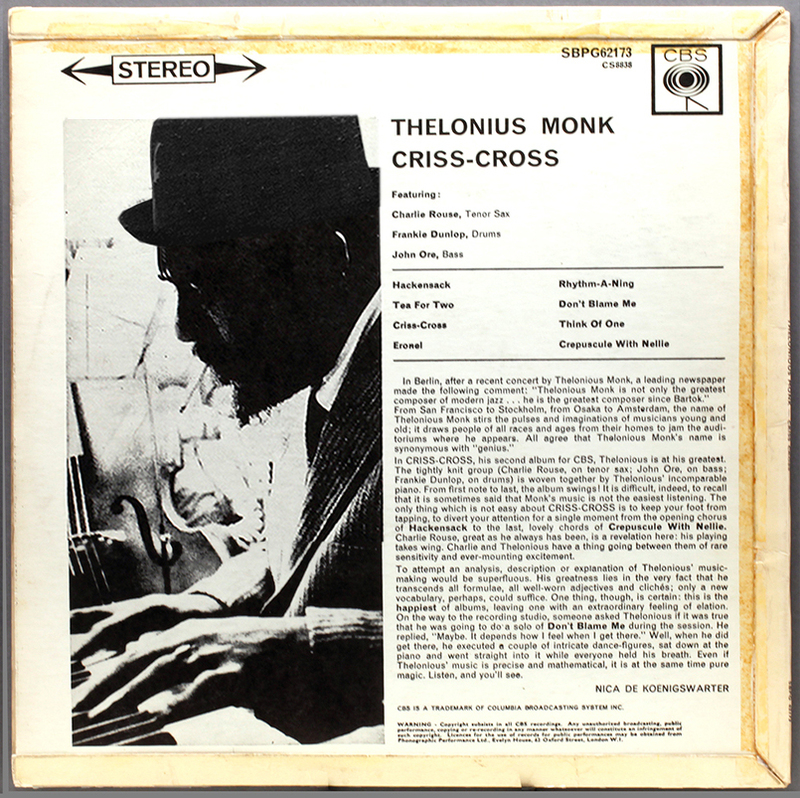 The title cut also reflects the ability of the four musicians to maintain melodic intricacies that are at times so exigent it seems cruel that Monk would have expected a musician of any caliber to pull them off. Yeah, that’s what I thought too, but he said it better. On to the contest. A double take of a cover which is already a mirrored double take: you are ahead of me it’s Double Crossing Time. 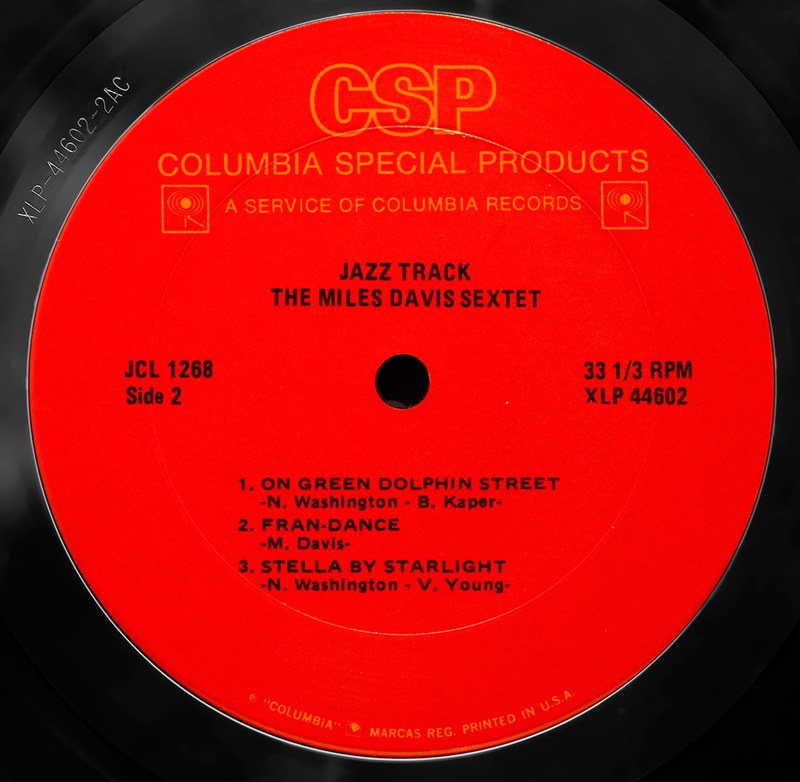 The Kind of Blue precedent suggests not that promos were distributed long after the first commercial release (to re-energise sales) , but that promos were pressed with whatever cutting came to hand, as supplied to whichever plant manufactured them. A-B-C sequence applied to commercial release manufacture, possibly, but not necessarily to promo manufacture, which used Columbia’s multiple-supplied cuttings arbitrarily. 2. the original on the left. Monk wears his trademark pork-pie hat on the left, a Vladimir Illyich Lenin workers flat cap on the right. Cue Workers Playtime. I though they had doctored the same picture but Sothebys have just rung in to confirm they are different photographs. With several points on my artistic license already, I decided to give the CBS Monk back his pork pie hat. Lenin was never much cop on the piano. Oh oh. Email just in from the Campaign Against People Smoking on the Back of Record Covers, on the dangers of tertiary cigarette smoke. Symetrical 1C/1C stampers, and hand etched on Side One “SM” (presumably Santa Maria, Calif) and the start of a five-bar gate, presumably stamper numbering. 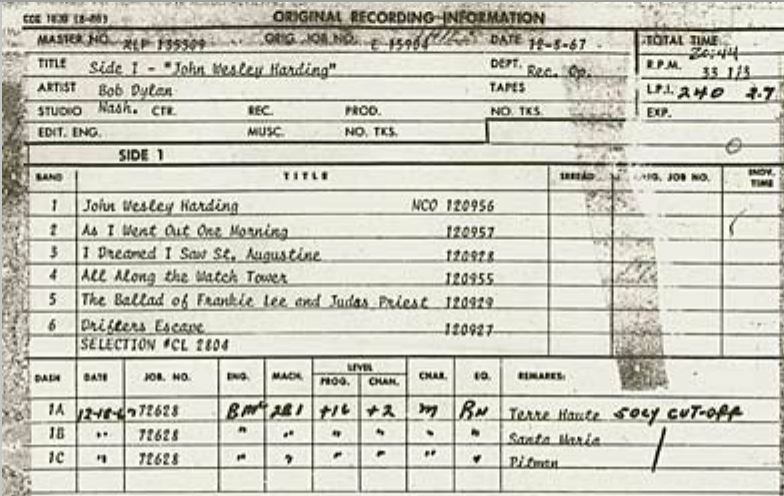 If, at this time, cuttings for the commercial release were despatched to all three Columbia plants, and there is some evidence that in some but not all cases they were issued 1A – Pitman, NJ, 1B – Terre Haute, Ind, and 1C – Santa Maria, Calif (evidence from a Bob Dylan title) The logic of distributed manufacture close to markets suggests 1A 1B and 1C are equally 1st pressings according to the provenance of the originating metal-ware, since the multiple cuttings of Columbia recordings were all produced at the same time, merely manufactured at different locations close to markets. Speaking Columbian a little more fluently every time. This entry was posted in CBS, Columbia, LondonJazzCollector, Thelonius Monk and tagged Charlie Rouse, Frankie Dunlop, John Ore, Mono, Stereo, Thelonious Monk by LondonJazzCollector. Bookmark the permalink. Rich, I have just updated the old 2012 promo label pictures and added a set of the Columbia two-eye which I added to my collection some time later. Same as yours? The Columbia manufacturing story continues to unravel. It’s from the early 70’s, I believe, and appears to use the same metalwork as the original stereo. I’ve heard these issues don’t sound so great, but this sounds OK to me. I assume it looks something like this? Is your copy a stamped matrix? What are the last three digits? (no, this is not a credit card scam) just to check whether you have the original first tape mix source (the one pictured is a second mix) and which cutting it originates from. Columbia made many dozens of cuttings or copies from each tape mix I am not sure what the expression “original metal” means in the context of Columbia. As far as I understand Columbia manufacture and distribution, plating and metal manufacture was done locally. If what you have sounds good to you, that is the only criteria that matters. The difficulties however start when you hear editions that sound better. That way madness lies, comparative listening. I’ve got the Mono how much would this old boy get these days though it has the red Columbia label rather than the white? I see it from time to time, its not extremely rare and its 1962, not 1957. I’d put it at £30 – 35? I’m guessing mind you. Regarding mono vs. stereo – have you heard discussion/argument over using mono cartridges when listening to mono recordings? What about settings on your receiver/preamp/whatever that switch from stereo listening to something more geared for mono? I had posted elsewhere (I’m sure you remember) about getting a lot of bright sound from my Blue Note recordings on a much less sophisticated system that yours. However I noticed something yesterday – if I put my head directly in front of a speaker, or if I am in a certain spot only about a foot from each speaker, that top bit that gets distorted or static-y goes away and everything sounds beautiful. I’m thinking of unhooking one speaker and see how different my records sound. It’s been suggested to me that the two channels might be the slightest bit out of sync with each other, any perhaps this is making mountains out of molehills. Linn gear does not include a mono-stereo “switch” on the basis that all “switches” degrade signals. The only moving part is the on-off power switch. The economics and logistics of having both a mono and a stereo cartidge and swapping them over, or two turntables, is a bridge too far for me. I can just about cope with one! Yeah, the cartridge seems like a far fetched alternative. So many of my LPs say on the back that they can be played on stereo and mono equipment just fine. Speakers out of phase is always a possibility, though possibly too obvious. Swap one of the + and – speaker wires around to see what happens (switch off during changes course). Speaker position relative to room dynamics can cause issues. Distance of rear port from the rear wall can cause an echo reflected back that is slightly out of phase. Also of the room furniture or space of each speaker is asymetrical, then you can get differences in the ambient acoustics. Its endless but good for sharpening up your ears. Excellent post! Reminds me to play my 2-eye stereo pressing too! I am huge Monk fan and especially love is Columbia recordings. After starting with his Riverside sessions, I find I now pull his Columbia LPs out more often. Monk’s output on Columbia ranks as one of the best buys in jazz LP collecting – as first pressings routinely sell for $10 to $15. I know they pressed a ton of ’em but that is ridiculously cheap! 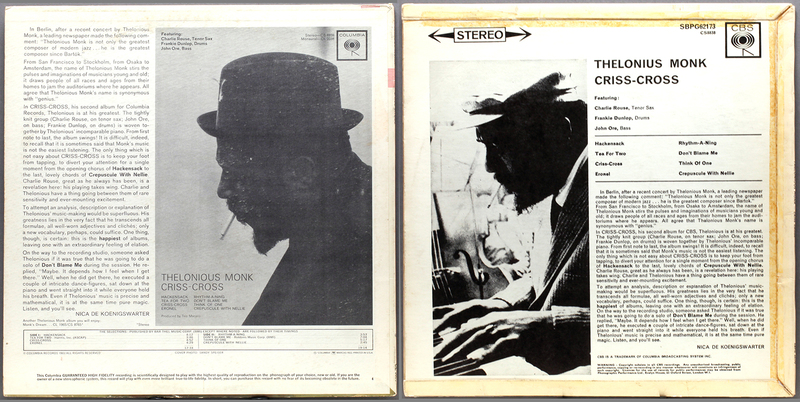 They’ve misspelt Thelonious in large letters at the top of the back cover. Your photoshop work is very nifty. Ah Thessalonikius Monk, the well known Greek pianist. I would never have noticed John, well spotted. To my ears the stereo mix sounds disconnected, with the drums panned far left and Monk’s piano way off in the right corner. It essentially turns it into a Charlie Rouse LP as he’s the only the only man dead center in the mix (apart from Ore’s bass which sounds pretty silly, so separated from the kick drum). Worst of all, when Monk is soloing, the soundscape seems incomplete as no lead instrument is occupying the center space. The problem lies in the fact that the stereo mix is an utterly implausible portrait of this musical event. This quartet would have been playing reasonably close together in the studio and no one witnessing their live performance would hear anything like the instrument separation the stereo LP sports. Just try listening to it on headphones and you’ll immediately hear how misshapen the stereo image is. I own a mono CBS pressing of this LP and it sounds wonderful. It’s the only way to go with this album. P.S. Much as I love the idea of the CBS art director pasting a different hat on Monk’s head, sadky these are two different photos. 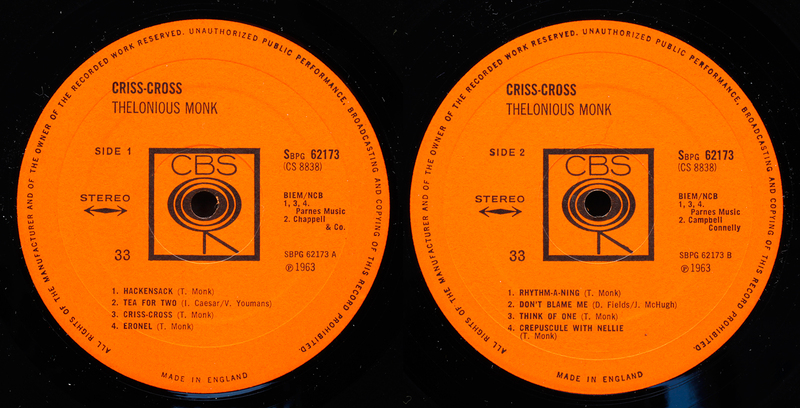 CBS are however, the outright winners of the Worst Copy Proofing Award…for misspelling Monk’s name on the back cover. What a great LP to review and a fascinating way to do it too. What fun, The X Factor comes to LJC! Text S to vote for Stereo, or text M …..
You are spot on about the eccentric stereo placement. Monk is side-lined in the position as a rhythm section piano might be, whilst Rouse is given centre stage. The stereo of Coltranes Love Supreme has the same problem, with him holed up in the left speaker for 40 minutes. The limitations of MP3 doesn’t preserve the delicate transients but listening through a proper hifi, on the Factory Sample, Monk’s piano sounds like a real piano. On the CBS it sounds like a piano under a pile of blankets. Anyone who manages to mis-spell “Monk” deserves some kind of award. Stereo Columbia two-eye – I bet that sounds nice! Hats off to anyone who can tell a significant difference! Both sound good on my computer. The only way to tell would be to hear the real thing. You are of course right Guy. The MP3 sound from a simple USB TT eliminates much of the differences. Otherwise why would anyone need good hifi? The stereo is “superficially” attractive. The refined quality of the mono is lost with inexpensive USB TT. Oh well…back to the drawing board. I’d buy this record for the cover design alone. Stereo sounds great on this one 🙂 Much more rounded and fuller sounding, although I do prefer the original back cover….